Too hot to move; Don’t care, won’t care. Late afternoon down my street in high summer temperatures. The start of lost days, dog days, just don’t give a **** days. Waiting for the rain in this heat. I like this photo. This is the end of my street. If you have the inclination to go beyond, the sea is 400 miles away to the west. But why drive on? Stop for a kebab. stop for a coffee, for a beer, for life. Just sit around at the local café and get slowly mellow on rosé wine – all those songs of alcohol and nonchalance are at the end of my street. “Pass me a bottle Mr Jones.” The road to the end of the world is just beyond these signs. The road movie awaits you – and at the end of this road, all those parts of dead France you have to cross to get to paradise. Welcome to the daily mediocrity of France. This is like where you live but in French. We are just as crap, just as poor, just as trapped as you. Don’t fantasize. This is our small-town reality. 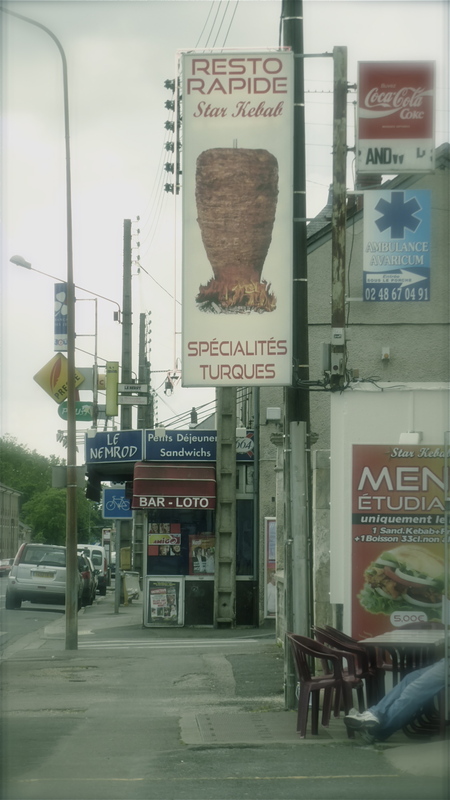 Posted in Death, Food, France, French, Holidays, TRAVEL and tagged Avenue de Dun 18000 Bourges, Bourges, Le Nemrod. Bookmark the permalink. I’d say this rather is the crap side of life!